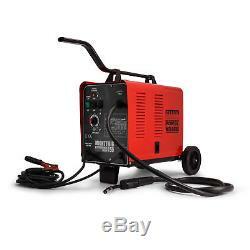 Sealey MIGHTYMIG150 Professional Gas/No-Gas Mig Welder 150amp 240V. One of Sealeys professional MIGHTYMIG range this compact gas/no-gas welder offers excellent performance at an extremely competitive price. Forced air cooling to maximize duty cycle performance. 1 x Comfort grip non-live torch. 1 x 1.8mtr earth cable. 1 x 1mtr gas hose. 1 x 0.45kg flux cored wire. 1 x 1.0mm contact tip. Gas Type: CO_/Argon mix & Argon & CO_. However, should you require to return any product, we will allow you to do so within 30 days of the day of receipt (EG if the item is an unwanted gift). If you do this, please contact Toolstop quoting your original invoice number which will have been included with the goods. You will have to arrange the return of the goods yourself and track them using a reputable carrier. This will help speed up the whole process. We can arrange uplift of the items at an extra charge. Toolstop will arrange the uplift of the goods. If you can see any damage whatsoever to the packaging sign for the goods as damaged. The item "Sealey MIGHTYMIG150 Professional Gas/No-Gas Mig Welder 150amp 240V" is in sale since Thursday, March 16, 2017. This item is in the category "Business, Office & Industrial\Metalworking/Milling/Welding\Welding & Soldering\Welding\Welders, Cutters & Torches\MIG Welders". The seller is "tool-stop" and is located in Hamilton. This item can be shipped to United Kingdom.